Over the last 2-3 years, employers and employees alike are facing compounding challenges over rising healthcare & benefit costs. Recent legislative reform and emerging healthcare trends are rapidly changing the employee benefits landscape. At HAWK Advisers, we believe it is necessary to bring transparency to these issues and that was the intent and purpose behind our latest seminar. 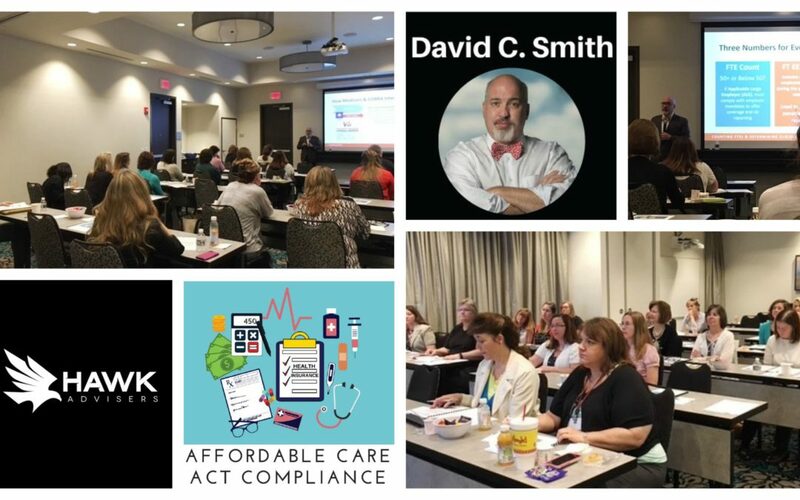 His industry peers affectionately know David Smith as the “Answer Man” when it comes to Affordable Care Act Compliance. With hopes to bring some of those answers to fellow health insurance plan administrators and business owners of the Roanoke Valley, we decided to host a seminar on Wednesday, May 16. David Smith attempted to differentiate common myths vs. facts and encouraged people to read past the “headline” news. We compiled the extensive list of seminar topics and have provided you with the five key takeaways from our seminar. One of the ways that the Trump Administration has proposed healthcare reform is through the Executive Order issued in October 2017, which provided directives surrounding Association Health Plans. Association Health Plans allow multiple employers to purchase health insurance together as one big group. The theory here is that smaller employers can buy coverage together cheaper than they can on their own. However, the reality is that this “group” pricing model is already in effect under most small group laws today, and continues to be very tightly regulated in most states. Questions remain as to whether consumer protections will be put in place to avoid any of the past issues that have surrounded these plans. There has also been a great deal of buzz surrounding Short Term Medical Plans, which are currently offered as an alternative to individuals having no coverage at all but with significant coverage limitations. Under current laws, Short Term Medical Plans can last up to 90 days maximum and can renewed up to 4 times. Proposed regulations would permit 364-day short-term medical policies that could be renewed indefinitely, permitted you qualify for coverage. While Short Term Medical plans are mainly focused on meeting the needs of healthier individuals who do not qualify for subsides or do not feel they need full coverage, they could potentially be seen as an alternative option for some employers to provide coverage for spouses or children in lieu of higher employee contributions on their group health plan. 60% of those responding to a survey of senior-level HR and finance executives at U.S. companies ranked compliance with the Affordable Care Act as a top priority, even after three years of ACA reporting and IRS audits. Not surprisingly, the top concern remains the cost of health plans offered to employees. It is important to remember that for now the ACA remains the law of the land, so employers should continue to stay diligent in their compliance efforts. For example, be on the lookout for Employer Marketplace Notices and Employer Shared Responsibility Notices. These notices can carry significant penalties if they are not responded to in a prompt and accurate manner. Employers should also anticipate for annual changes in affordability laws. In fact, on May 21, 2018, the ACA Affordability standard for groups that renew on or after January 1, 2019 was announced by the Trump Administration. The percentage will increase from 9.56% to 9.86%, an increase that catches up from the unexplained drop for this year. Growing bipartisan support for paid family leave laws has led to an increase in state and local mandates for these types of laws. For example, in the state of California, employees now accrue one hour of paid sick time for every 30 hours worked and they can use up to 24 hours and accrue up to 48 hours. In addition to that, we are also seeing cities within California adopting policies that allow for additional leaves and protections such as what we have seen in San Francisco. Both political parties have agreed that they want to see national legislation addressing this issue. It is no longer a question of “if” it will happen, but rather “what will be covered” and “how it will be paid for.” Currently, thirty-seven states are following federal guidelines for unpaid leave, eight states have expanded unpaid family leave, and five states and Washington D.C. offer paid family leave. This is a trend to keep your eye on, as expansion around paid family leave laws is likely to continue. You may have noticed different types of walk-in medical centers popping up all over your city. Urgent care centers have become increasingly popular, as patients are fans of the easy-access, extended hours, and efficiency for treating routine health needs. They also generally offer more in the form of a board-certified physician, plus additional services such as X-rays for potential broken bones. Claims for services rendered in urgent care centers are now 17x higher than they were in 2007, while Emergency Room claims grew over 230% over the same period. The average urgent care visit costs $250. This is often traditionally cheaper than an Emergency Room visit, which costs an average of $750-$1,000 per visit. In addition to urgent care centers, there are a few other relatively new ways to receive urgent medical care. Some pharmacies and shopping centers are now offering retail health clinics. These retail health clinics allow you to walk right in and get care for minor illnesses and injuries, without an appointment. The average cost for a visit to a retail health clinic is $100, which may lend to their growing popularity, especially for those seeking immediate attention for a more minor health issue. Thanks to modern technology, many patients now turn towards telemedicine for their medical needs. With telemedicine, you can see a family doctor by video on your phone or computer, anytime or anywhere. The benefit of telemedicine lies in its ease of access, timesavings, and significant cost savings. Many health plans cover telemedicine at about the same as what you would pay for a regular doctor’s office visit, but without the hassle of the waiting room. Health insurance costs are expected to rise on the individual marketplace based on the individual mandate penalty reduction, but not nearly as much as feared. Recent reports from the CBO predict that ACA premiums will rise by an average of 15% next year. Individual rates have increased over 300% since 2014. However, given the fact that everyone can buy insurance, regardless of health status and/or history, the increase in rates over time is not very surprising. Since health insurance costs can vary greatly on the marketplace depending on the plan and level of care you select, it is important that consumers understand and carefully evaluate all of their options before making a decision. With the Individual Marketplace’s 2019 Open Enrollment approaching November 1, questions remain as to how many people will enroll in coverage and what the health status of those people will be. On the employer side of the issue, small and large group rates have seen much lower increases than the individual marketplace has experienced. In particular, self-funded employer groups with 100 or more employees have seen the lowest increases overall. With the survival of the Affordable Care Act (so far), David Smith likes to say…it is easier to promise something, but harder to do.